Having a meal in Sheesh Mahal will take you back into the era when the traditional “Theekri” glass work was popular amongst masses. Delicious food served in all glassware will provide you with an unforgettable experience. And just look at the interiors, which are taken to its peak with all hand cut mirror work and frescos on the ceiling. The entire view is sufficient to pour your heart with joy, to provide you with the feeling of being a part of royal era. 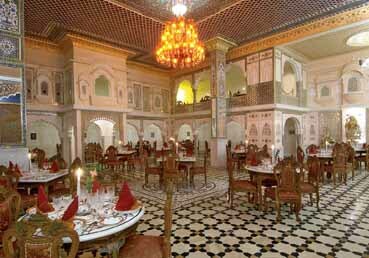 The kitchen of Sheesh Mahal contains a great range of North Indian cuisine along with Tandoori and Mughlai food. A number of cultural programs are also performed so that you may enjoy your meal with utmost joy. It entails Indian traditional, folk and classical dances by renowned artists. Though we take a good care of your comfort, we recommend you reserve your seat in advance in order to stay away from any kind of discomfort.